Jim and Eileen first visited Alaska back in 1987 while spending three weeks camping along the Kenai Peninsula and in Denali National Park. They immediately fell in love with the largest state in the U.S. They were impressed by the size of the wilderness, the abundance of wildlife and the varied landscapes. The duo has visited many other states since then, but Alaska has always been their favorite. They became fascinated by all Alaska has to offer; it has 29 volcanoes, is the only state to have coastlines on three different seas (the Arctic Ocean, Pacific Ocean and Bering Sea) and houses more than half of the world’s glaciers. It’s also only 55 miles east of Russia! 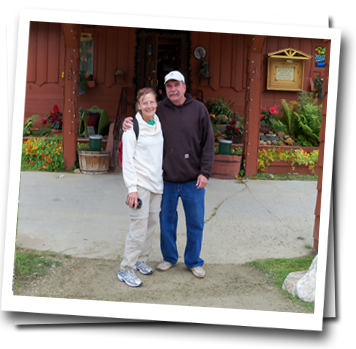 In 2004, Jim and Eileen had an opportunity to purchase the Cantwell RV Park and relocate to Cantwell, Alaska. For almost the past decade, Jim and Eileen have spent their summers continuing to explore Alaska and running the RV Park. For the rest of the year, they live in Florida (where they have been since 1984). In the winter, Jim works as an electrician and Eileen works in a hospital. Each April, they pack up their camper van and their dog (Molly) and travel back up to the Great White North. They simply love owning the RV Park and especially enjoy talking with visitors about the many thrills of Alaska. For them, they get to experience the best of both worlds by living part of their year in both Florida and Alaska. Jim and Eileen invite you to come and experience all the majestic beauty that Alaska has to offer! You are sure to fall in love with the state just the way they did all those years ago.